Section back at Devil's Island with woodland caribou antlers from northern Quebec. 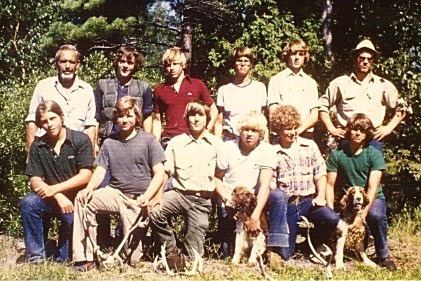 Front row, left to right: Jeff Pratt, John Rykert, Peter Nichol, Iain MacInnes, Grant McCutcheon, Kevin Brown, Back Row: Heb Evans (staffman), Bob Wilson, Greg Stainton, Bruce Ingersoll, Glenn Lower, Steve Bissell (guide). Heb's dogs: Wendy (center), Tinker. We have been forced to alter our original plans to investigate the Savant Lake area to the west. A most unusual lack of rain and snow in that area since early last fall resulted in fire restrictions, starting April 1, plus a water level far below normal such that both our section and Section A will be traveling in Quebec. Through the winter and spring we have been planning both possibilities, so we have been ready to go either way. This area is more virgin than our western planned area, but I have been over the major routes in previous years with Section A. There is no road communication after we leave Mistassini Post, but the area is well traveled by Indians during fall, winter and spring — most of them reside at the Post in the summer. Most portages are well established and well traveled. Roughly in the middle of the season we'll be re-outfitted by air from Chibougamau. This will be our only planned communication with the outside. Heb took Grant McCutcheon and Bob Wilson to Bellinger Lake, five days early to assist in finding and constructing a summer base camp. They drove up with Section A to Mistassini Post where they stored the section's gear and canoes in a HBC warehouse. Then they drove back to Chibougamau. A single Beaver flight flew them with base-camp gear to Bellinger Lake. The gear included Heb's red square-stern canoe, motor, gasoline, chain saw, assorted tools, large tent, bush stove for tent, personal gear, a jewelry, a food wannigan, two regular tents and two dogs. After landing at an Indian site on a beach, they hooked the motor onto the canoe and went in search of a site for the summer's base camp, which they found that day. Over the next four days, using spruce logs, they constructed a food cache (posts wrapped with metal from pails and cans to discourage animals), dock and pole frame for a 16 by 20 canvas tent. The tent frame had four foot side-walls and a vertical pole in the center of each end. These poles supported a ridge pole. Copyright © 2000-2013 Brian Back. All rights reserved.